The entertainment factor derived from playing one of the most popular game genres is priceless. Video slots have become the most entertaining casino games, ones that can be played with very low bet amounts. You can bet anything from a nickel to even hundred dollars per spin, making these games available both for small bettors and for high rollers alike. In the past these games were just mechanical machines that were played with pulling a lever. Today, they are sort of like small computers, with a processor and software programmed to give random results, and all with just pressing a single button. The most valuable information for video slots that slot players can arm themselves with is how these games work. To be more successful in playing them, they need to fully understand how video slots function and thus what their biggest advantage when playing them is. The technology behind video slots and electronic casino games that makes them give out random and fair results is the RNG (Random Number Generator). This is the brains of the video slot telling how much the reels have to spin and when they should stop. The RNG can produce billions of combinations eliminating the misconception that the reels spin in patterns and that the cycle can be determined. In order for casinos to ensure players that their games are totally fair and that they give totally random outcomes, they perform regular auditing and testing of the Random Number Generator on an annual basis through independent testing agencies, which then give them certificates that everything is in order with their games. The RNG generates combinations the entire time. It is in perpetual motion and the numbers generated correspond with the symbols on the reels. With each pressing of the spin button, the processor chooses the set of numbers generated at that millisecond, which is then translated by stopping the reels showing certain symbols that correspond with the numbers. Each symbol has an equal chance of appearing on the reels and you need thousands of spins for the same combination of symbols to appear twice on the reels in the same positions. Since the RNG generates winning and losing combinations the entire time, it means that every second you hesitate on pressing the spin button you might have missed a jackpot. To hit the spin button at the exact millisecond to win the jackpot is pure luck. In the past, 3-reel slots were the only slots available. As these games evolved, they’ve become 5-reel slots, which makes them even more fun giving more chances for winning combinations. More reels means more ways for hitting a payout. 3-reel slots are much simpler and are much easier to understand and therefore players are limited in betting options when playing 3-reel slots, which makes winning less frequent. Since 5-reel slots feature more reels, they also have more paylines, giving players a chance to win more on a shorter run. 3-reel slots on the other hand have only one payline. Because of this, payouts on 5-reel slots are more frequent. On the other hand, 5-reel slots feature more bonuses in different forms, such as free spins, second screen bonuses, and have additional symbols such as scatters and wilds that activate multipliers with which your payout is multiplied several times. These symbols help 5-reel slots maintain a bigger variety of outcomes. 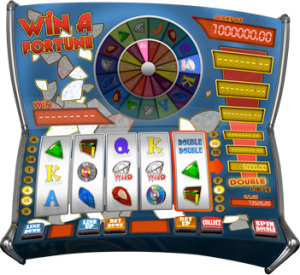 Furthermore, 5-reel slots generally have better interface and graphics, and have the tendency to be more exciting and entertaining. 3-reel slots are mainly designed in a classic style with two-dimensional inanimate symbols. 5-reel slots tend to be 3D, with cartoon-like animations or movie clips based on the theme according to which they were designed, as in the case of The Dark Knight slot among many, themed according to the Batman movie. All of this gives a greater sense of entertainment. Progressive slot machines have larger jackpots, usually a life-changing amount that can be even several millions of dollars. The chances of hitting a progressive jackpot can be astronomical, but it’s not like progressive jackpots have never been hit. We’ve seen cases where the same player has managed to hit a progressive jackpot twice in just a couple of months. Progressive slots are a group of slots linked together in a progressive network. The progressive jackpot is made by taking a small percent of each wager made on a slot in the network, and as people play, the jackpot becomes bigger. This jackpot can be won by playing any progressive slot in the same network. Because of the fact that a progressive jackpot is much, much bigger than a normal jackpot on a regular slot machine, the payouts for other winning combinations on a progressive slot machine tend to be smaller.